Published: Nov. 2, 2015 at 02:00 a.m. Updated: Nov. 2, 2015 at 01:19 p.m.
DENVER -- Slowly, the smirk split Peyton Manning's face. For the first six weeks of the season, results be damned -- and they were unbeatable results -- Manning had faced questions about his accuracy and his arm and his age. They were valid questions, and Manning, his obvious discomfort on the field writing the storyline, was pulled into a narrative that seemed to lead inevitably to a sad conclusion. 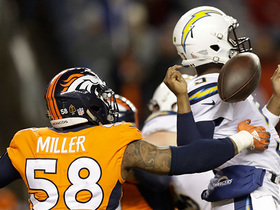 But on Sunday night, as the franchise celebrated an earlier incarnation that used the running game as an engine to pull an older quarterback to glory, these Denver Broncos finally had their statement game. Even DeMarcus Ware admitted playing against the Green Bay Packers amounted to a measuring stick, and what was so odd is that it had come so many weeks later than Manning is used to making statements. It was resounding nonetheless. The 29-10 victory over the Packers will go down mostly as a staggering display of the Broncos' dominant defense, which held Aaron Rodgers to just 77 passing yards -- the fewest he has thrown in a game he started and finished since he became the Packers' starter. But what made this game so critical for the Broncos before it began, and what made its outcome so worth noting, was what it said about the offense. 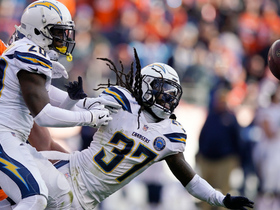 What it proved was the offense Gary Kubiak envisioned is more than capable of providing an adequate complement to the defense when the offensive line is blocking and the running backs are finding holes. It also proved that Manning -- while his arm, his age and his accuracy still will surely be questioned again this season -- might not have morphed, as some have come to suspect, into an anchor on a team that is otherwise ready to sail into the playoffs. Manning has come to believe that his early inaccuracy has been the result of his indecision, and that has been borne of his unfamiliarity with Kubiak's scheme. But on Sunday night, with the benefit of a bye week to study and tweak, he was decisive and sure and with one pass to the deep left sideline for Demaryius Thomas, he recalled the many passes of old he has completed. They might be fewer and far between, but they are still there. And when Manning can summon them -- and he and Kubiak clearly think more are on the way as the offense continues to settle in -- the Broncos can beat anyone. In beating the Packers, they beat one of the last undefeated teams in the league to remain undefeated themselves. There were bootlegs and rollouts and 340 yards and a quarterback who seemed more comfortable in his skin and in his role than he has all season. Which is why, when the question finally came about the commentary that had surrounded him and whether it might be satisfying to show everyone he might not be finished, the tight smile on Manning's face told the story. "How can I say this without hurting anybody's feelings?" Manning said. "I just don't give what y'all say that much merit. I'm not going to put a Jim Mora on you and say the famous, 'You think you know, but you just don't know and you never will.' Although that's a great line, I'm not saying that. I'll say it at some point before I stop playing, but it's not the time now. I have just been very determined to get comfortable in this offense. "We are all 100 percent committed to getting on the same page. We're not where we want to be yet. "I knew this was not going to be an easy transition. I can't say that a lot of what's happened so far this season has been a surprise to me. There were going to be some rough times, some rough patches and rough parts of the transition. "I don't look at this like an 'I told you so' moment. I don't listen to what you say in the first place." Manning was smiling as he said it, but don't miss the strong undercurrent of truth there. Manning is well aware that he is being written off, but he also, perhaps more than anybody, anticipated that he might endure an especially trying season in what might be his last one. The transition has not been smooth and that is not entirely -- or even mostly -- Manning's fault. 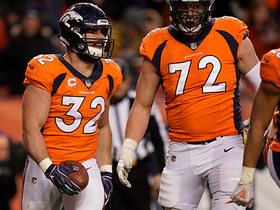 The Broncos' offensive line has endured injuries that have strangled its effectiveness. The running game had largely disappeared. The tight end situation was not where anybody wanted it to be. 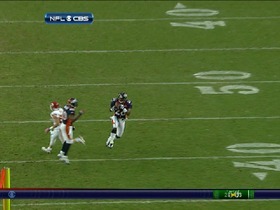 And Manning's brain, his greatest weapon, had clearly been clouded by his lack of mastery of this new offense. His mind had always been able to compensate for his physical shortcomings, particularly in the years since his neck surgeries took something away from his arm. But in the season's first couple months, he was more vulnerable than ever to error. In the postgame Sunday, Manning made a particular note that after weeks of being close on some deep passes, the Broncos finally hit some. "He's gaining confidence in guys he's playing with," Kubiak said. The strike to Thomas for 47 yards on the first play of the second quarter was old-time Manning, not old Manning. And it was the kind of healthy throw that Manning had used as his own personal barometer when he was recovering from his neck surgeries. He threw a deep out to his left in a practice session he held on his own and when he saw it on tape, it was so significant to him that he made a copy of that throw and texted it to significant people who were following his recovery. There will be no time now for that kind of self-reflection. The offense is still very much a work in progress, and its evolution will be essential to the Broncos' postseason chances. They will find out more about how they stack up against teams they will likely face in the playoffs -- the Colts next week (where Manning can break the tie with Brett Favre for most career wins), the seemingly insurmountable Patriots later this month, the Bengals near the end of the season -- and even Manning said that the results this week guarantee nothing. But for the first time this season, the ride into the sunset that so many seem to be rushing Manning into, that had seemed inevitable for a few weeks, didn't seem as likely to finish in a dead end.